HOUSTON – Texas Southern’s Omar Strong scored 34 points, highlighted by seven 3-pointers as TSU won its 11th straight game, 79-66 over Southern on Thursday night effectively taking control of the Southwestern Athletic Conference regular-season championship race. Strong was 9 of 15 from the field, including 7 of 13 from 3-point range as Texas Southern surged ahead of Arkansas-Pine Bluff and Southern into sole possession of the SWAC lead with just one regular season game remaining. TSU will have the opportunity to clinch the outright title against Alcorn State on Saturday. 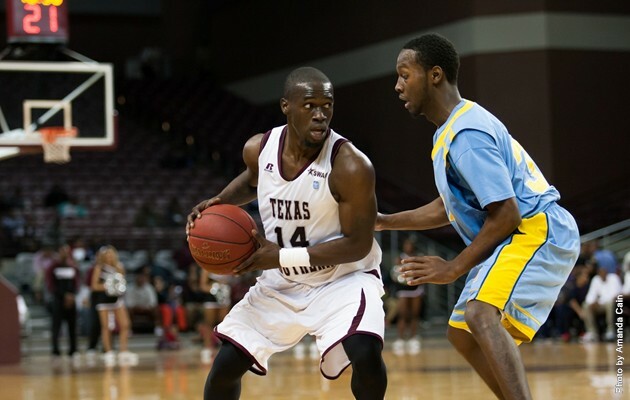 Ray Penn contributed 14 points for Texas Southern, and fellow teammate Fred Sturdivant tallied nine points, nine rebounds and six blocked shots. With the victory the Tigers snapped Southern’s four-game winning streak. Texas Southern never trailed after the opening minutes and built as much as a 24 point lead in the second half. After a slow night offensively against Alabama State on Monday Strong wasted no time in getting back to his high-scoring ways. Tonight he notched his fourth game in which he has scored at least thirty points this season. TSU clinched at least a share of the regular-season championship with the win tonight over the Jaguars. Strong’s outing against SU on Thursday ranks behind only his 39-point scoring outburst against Colorado in November. TSU set the tempo for the game in the first half as Strong made 3-pointers on back-to-back possessions to stretch the Tigers advantage to 37-21 with two minutes remaining in the half. The Tigers pushed their lead to 20 points with 13 minutes left in the second half, and Southern never got back into the game from that point as Texas Southern closed out the victory in front of an enthusiastic home crowd of 4,108. Texas Southern outrebounded the Southern Jaguars 43-29 while also edging SU in transistion points 8-6. TSU’s Sturdivant nearly captured a double-double as he scored nine points to go along with nine rebounds. Texas Southern shot 43 percent from the field (23-of-53) highlighted by an impressive 52 percent showing from beyond the arc (11-of- 21). The Texas Southern Tigers will host their season finale on Saturday as they get set to host the Alcorn State Braves. Tip-off is slated for 8:00 pm at the H&PE Arena. Texas Southern is undefeated at home at 8-0. Fred Sturdivant tallied six blocked shots against Southern. The Tigers had two players score in double figures against Southern. Omar Strong tallied his second highest point total of the season (34). Texas Southern has the sixth longest current winning streak in the NCAA (11).